March | 2016 | Wait…So That's What Catholics Believe?!?! Wait…So That's What Catholics Believe?!?! I’ve noticed a certain fascination that people have had over the past few years. It has developed a cult-like following and doesn’t seem to be going away any time soon. From “Night of the Living Dead” to “The Walking Dead,” from “Zombieland” to “World War Z,” our country has an infatuation with zombies. 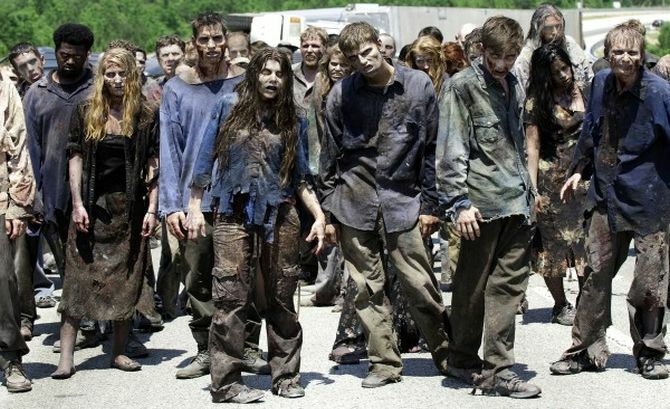 I’ve even seen sincere interviews with families regarding how they are getting ready for the eventual “zombie apocalypse.” In case you never heard of this phrase, the “zombie apocalypse” is when zombies are going to try to take over the world. And apparently if one bites you, you’ll turn into a zombie. So obviously you need to start stocking up on supplies now because one can only imagine the chaos that will result from such an event. Sadly, not a single presidential candidate has put forth a plan on how they are going to combat this impending doom! I bring this up because people read the Scriptures through the lens of their own reality. And if your reality is “zombies,” I didn’t want you to get confused with today’s readings. 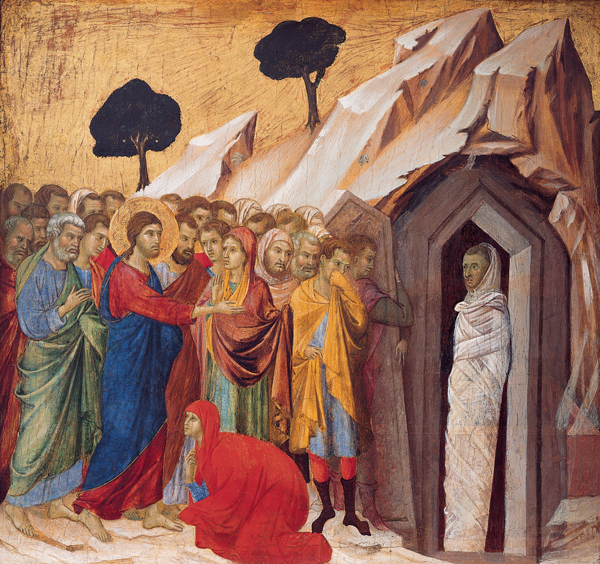 The first reading from Ezekiel states, “Thus says the LORD God: O my people, I will open your graves and have you rise from them.” The Gospel of John recounts the story of Jesus raising Lazarus from the grave. So just to make this absolutely clear…we are NOT talking about zombies here! I actually did some internet research on the ever so reliable Wikipedia to find a definition of zombie so we can distinguish them from what the Scriptures are describing. It turns out that, “zombie is a FICTIONAL undead being created through the reanimation of a human corpse. The term comes from Haitian folklore, where a zombie is a dead body reanimated through various methods, most commonly magic. Modern depictions of zombies do not necessarily involve magic but often invoke science fictional methods such as radiation, mental diseases, viruses, scientific accidents, etc.” Thank you Wikipedia! Zombies are fictional, soul-less beings that used to be humans. 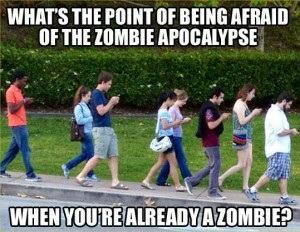 And apparently, these humans-turned-zombies only have one purpose in their lives, only one basic urge to satisfy, to eat. To fulfill this hunger they eat any living flesh they can find. And if they can’t find any, they just keep wandering around aimlessly. I’m sure this is all fascinating, but why is this Catholic Deacon going on and on about zombies? Because I’m here to warn you! Although I have said twice so far that zombies are FICTIONAL, I truly think the zombie apocalypse has already begun…but not in the way you may think! Think back 10-15 years ago. When people walked around, they made eye contact and said hello to people they passed on the street. Now, we have our heads buried in our smart phones and avoid eye contact. Instead of having an actual face-to-face conversation, we send a text. Instead of watching our kids play sports, we are updating our Facebook statuses on the sidelines. We don’t go outside, we go online. It seems the more we plug into technology, the more we unplug and disconnect from reality. Granted, technology can be a good thing, but I’m afraid it has turned us into mindless zombies, wondering around aimlessly through life. And if we keep feeding on what the world is offering, our hunger will never be satisfied and the “zombie apocalypse” will continue to get worse. Now, I can’t leave you in a state of despair and without hope! I mean, I pretty much just labeled all of us zombies. However, you are in luck… I have found the antidote! It boils down to two words, a name really… Jesus Christ. From today’s Gospel reading, Jesus said, “I am the resurrection and the life; whoever believes in me, even if he dies, will live, and everyone who lives and believes in me will never die.” This is also what the LORD God was speaking of in Ezekiel when He said, “I will open your graves and have you rise from them.” Our God was NOT talking about reanimating corpses but instilling LIFE into our lifeless bodies! It’s about dying to sin and our selfish ways and rising to a new life in Christ. Jesus didn’t raise Lazarus to be a zombie; He raised him from the dead to give him new life! And unlike zombies who feed on any flesh they can find, we Catholics need to feed our souls and sustain our lives by eating the flesh of Jesus Christ in the Holy Sacrament of the Eucharist. He is the food that sustains us, which is why it is so very important to receive Him in the Eucharist frequently. This time of year, the upcoming Easter season, gives us the best example of how Jesus can give new life by looking at the RCIA process. This Rite of Christian Initiation of Adults is the process where non-Catholics convert to or come into full communion with the Catholic Church. At St. Andrew’s we have 6 people who, at the Easter Vigil, will die to their old selves and be given new life through the waters of baptism. We also have 4 candidates who have already been baptized in other faith traditions. These 4 will renew their baptismal promises along with all of us. And then these 10 “new” Catholics will receive the Bread of Life for the first time, the Holy Eucharist, to feed that hunger that is deep inside all of them. So my question for you is this… do you want to continue down the path of the “zombie apocalypse” or do you want to have new life in Christ? One pathway leads to death and wandering aimlessly. The other pathway gives you life and satisfies your hunger. So if you’re tired of being a zombie and you want to have new life in Christ, I suggest you frequent this altar as often as possible and receive the only food, the only flesh, that satisfies. 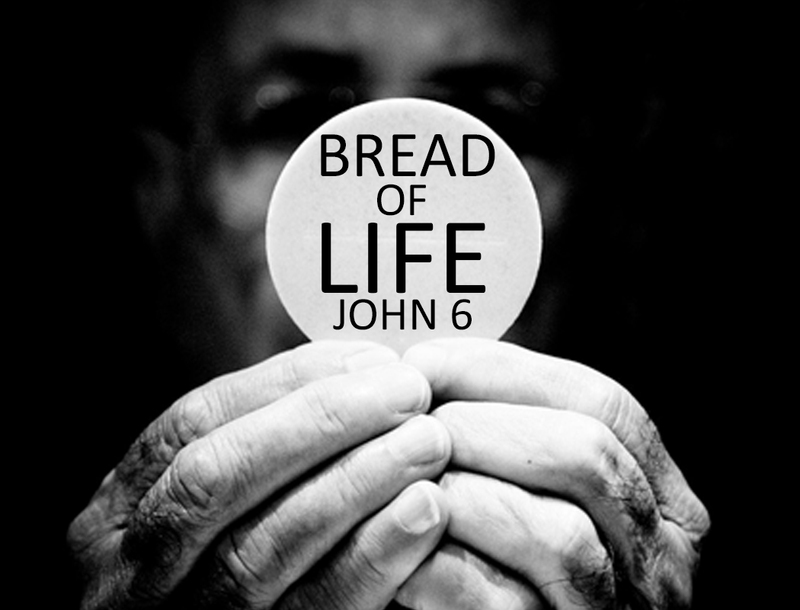 Jesus gives us new life and then feeds us through His Body in the Eucharist. It’s that simple. Now it’s up to us to choose the right path and be faithful!